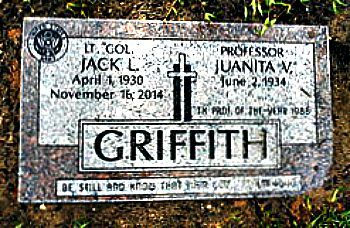 Jack was born in Ada, Oklahoma April 1, 1930. He honorably served his country in the United States Army retiring after 33 years of service at the rank of Lieutenant Colonel. Jack received his Doctorate of Animal Nutrition and Husbandry. He married Juanita Rodriguez May 10, 1988 in Fort Worth. 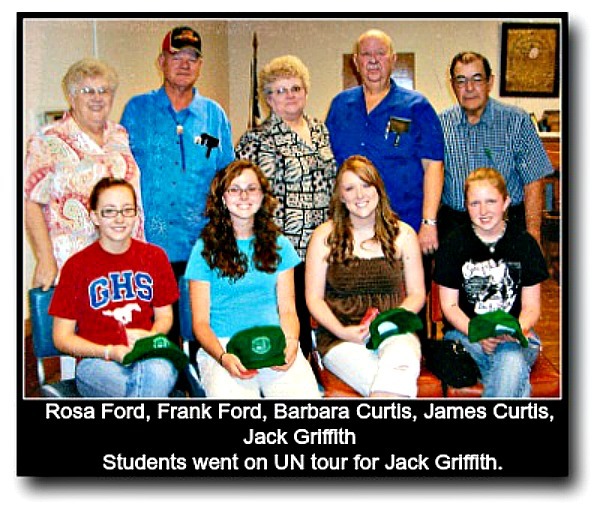 Jack was a member of the Independent Order of the Odd Fellows for many years and the LaJunta Baptist Church. 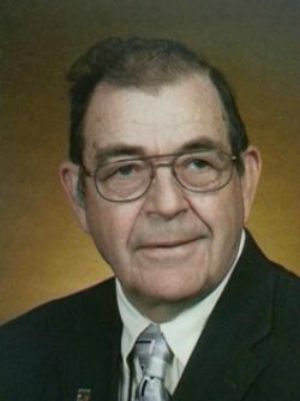 He loved teaching, he taught Chemistry at Ohio Northern University. After retirement he enjoyed spending time on his farm in Weatherford. 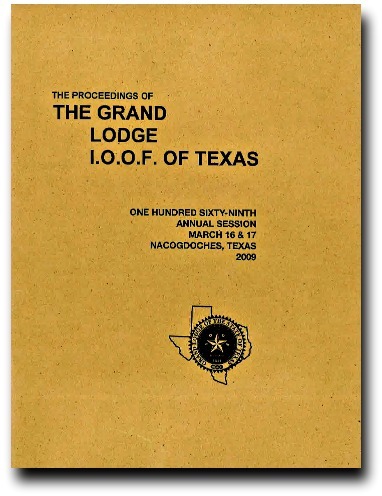 TO THE GRAND LODGE IOOF OF TEXAS: It has been an honor for me to have served the Grand Lodge of Texas and each of you as an Odd Fellow for the year 2008-2009. The Order in Texas is now 170 years old and has been a larger part of Texas history than most of us realize. I thank you for allowing me to serve you as Grand Master. You also provided me with a wonderful staff and committee to work with. Our goal has been to motivate and encourage to elevate the Odd Fellow standing in our community and society. In early times, Odd Fellows were well known for their character. The principles have not changed so we can regain that prestige again. It is an honor to be an Odd Fellow member. In April of 2008 we had 21 Odd Fellows and Rebekahs from Finland visit our Order at Ft. Worth Lodge No. 251, Kennedale Lodge No. 925, and Polytechnic Lodge No. 148. We treated them with a Texas style barbecue, a trip to Cow Town, and a Texas Rodeo. The visit was a highlight for we learned a lot about our Order in their country. Their membership is much larger than ours with over 8,000 members and a waiting list to join. Their meetings are more formal than what we have. I also want to thank Deputy Grand Master Danny Wood and his wife, Lana, for hosting and showing them a view of old Texas. You should see the pictures of them in Texas costumes from the old days. This year they are looking for a visit from Texas. April was also a productive month for we instituted Friendship Lodge No. 7 in Blue Ridge, Texas. We also had Degree Rallies at Denton Lodge No. 82, Gonzales Lodge No. 38 and Friendship Lodge No. 7 in Blue Ridge. It was a special honor for me to present the wreath to be laid at the Tomb of the Unknowns at Arlington National Cemetery in Washington DC along with Rosa Ford, President of the Rebekah Assembly, Paul Vest, Department Commander, and Lady Gene Phillips, L.A.P.M. President. I am retired from the military (Army) and it was quite moving to have this honor to represent the Grand Lodge of Texas. Our Grand Order has had many functions during the 2008-09 term. I did my best to attend as many of these functions as I possibly could. Fraternalism is a principle of Odd Fellowship. We must extend our friendship among ourselves, our community, and promote all the principles that Odd Fellowship stands for. I have a lot to be thankful for. 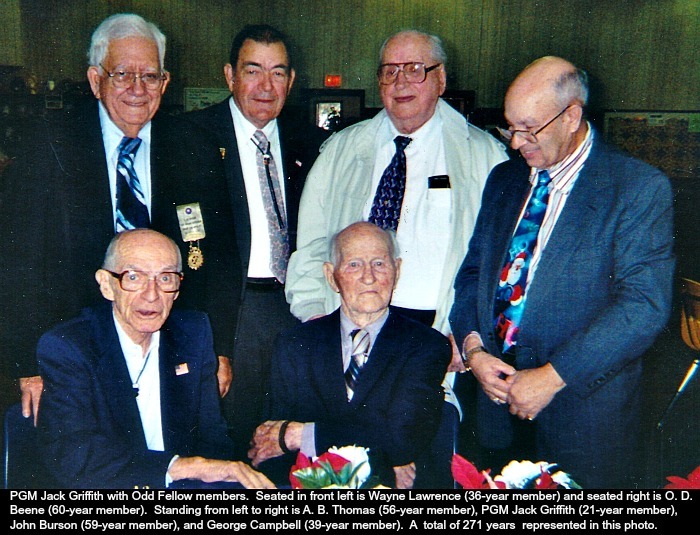 During my term as Grand Master, the success that we have achieved is not mine, but the cooperation of the Grand Lodge Officers, and the committees, such as the Executive Committee, Board of Trustees, Finance Committee, Youth Committee, Membership & Education Committee, Future Planning, and special committees, i.e., Building Committee and Nursing Home Expansion Committee. The input that every member gives is important in arriving at a sound decision. We are fortunate to have two Odd Fellows who are professional engineers serving on our Building Committee. We can be thankful for the quality and experience of the people who are serving our Order. Our objective has been to sustain membership, hoping to stimulate a greater interest for applicants to join our Order, especially younger members. We have also made some effort to provide direction towards a recognition in our communities of the history of our Order and the honor our Order has had in the past. In this respect, I hope each member attends the Grand Lodge session in March to see and hear the-reports of the Building Committees, the Youth Committee, and the Membership & Education Committee. We are hoping that in the near future, we will have a net increase in membership. If it doesn't happen this year, I am confident it will happen soon. I want to thank the Rebekah Assembly for electing Rosa Ford as President to serve as my partner. We have worked great together. She has helped me a number of times with my deficiencies. Thank you Rosa. The Office staff has been great. Thank you Nancy, Darline, Christy, and Sharon. Your conscientious dedication and commitment has been excellent. You should receive more credit for the success of our Order. Thank you. The Boards, the Chairmen and Directors, you keep us afloat as you manage and direct our activities. Your expertise makes us proud to be a member of our organization - thank you. The Youth Committee - you have excelled by bringing recognition to our Order by having the largest number of Junior Odd Fellow and Theta Rho members attending their Grand Session. Thank you. The 3 years that I have been a Grand Lodge Officer has been an experience of working hard to try to advance the Order through motivating, challenging and assisting some of our Lodges. We have some lodges who are doing a fantastic job in their communities. However, we haven't been winners in every case. I have appreciated having worked with each of the Executive staff - Danny Wood, Deputy Grand Master; James Teel, Grand Warden; James Curtis, Grand Secretary; Frank Ford, Grand Treasurer; and Connie Baker, Past Grand Master. We have worked and traveled together to make visits, helping with degree rallies, promoting leadership, and unfortunately, to do some damage or maintenance control or assessments. When looking back, our actions were positive or at least we did what was possible. Degree rallies are essential and teach the principles of our Order. An applicant is not a member until he receives the Initiatory Degree, then he can attend lodge and continue to learn. Our lodges and districts need to develop at least an Initiatory Degree team. For me, this should have some priority in planning by the local lodge level. After all, it is our responsibility to train and promote F. L. & T. in our lodges. At this point, I want to thank my Grand Lodge Degree Team Captain, E. Dixon Toney, and Assistant Captain Jack Tatum, for all the efforts they have contributed this year. You have traveled far and to many places to organize and perform your duties at Degree Rallies. Your expertise is not often matched. In regards, I will recommend that my successor appoint a tail twister or a hammer or whatever it takes to get more expertise and precision in teaching new applicants. I want to thank each and all for your wonderful friendship, love, and truth and your confidence in me as Grand Master for 2008-09. I have seen the rose in its beauty spread its leaves to the morning sun. I returned, and behold! it was dying upon the stalk. Its grace and form were gone; its loveliness was vanished away; its leaves were scattered to the ground, and no one gathered them again. I have seen man in the pride of his strength; his cheeks glowed with beauty; his limbs were full of activity; he walked, he ran, he leaped, he rejoiced in that he was more excellent than the rose. I returned, and. behold! life was departed from him, and the breath from out of his nostrils. Death is in the world and the spoiler is among the works of the Almighty. All that is born must die.